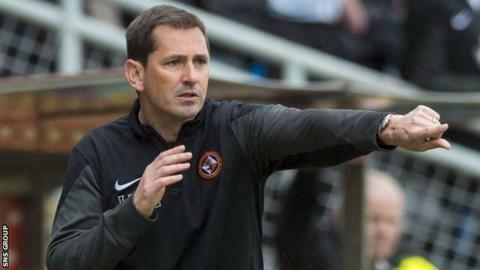 The focus on Jackie McNamara remains unremitting. Dundee United supporters have turned on the manager at times this season and there is a sense of disenchantment while results continue to disappoint. At his weekly press conference, McNamara was asked if he was approaching this weekend's visit of Inverness Caledonian Thistle concerned that a defeat might cost him his job. He replied that he did not and remains convinced that his team can change its fortunes, that a small number of fallibilities can be overturned. United look like a team in decline, albeit recent seasons have delivered consistent top-six Scottish Premiership finishes, cup final appearances and the development of some exciting young talents. Assistant manager Simon Donnelly admits that this spell could be described as a "transition period". There are other issues at Tannadice, though, that would suggest that it is the club itself, as much as the team, that is working its way through a time of flux. There is no doubt that the relationship between manager and support is strained. There are several underlying reasons, at least in the eyes of the fans, but results are the major bugbear, naturally. United have won only one of their fixtures this season and currently sit second bottom of the top flight. Disgruntled fans are quick to point out that this disappointing run follows on from last season, when United won only three of their final 18 games, losing 12 of them. Grumbles of discontent also centre on tactics with McNamara preferring to line up in a 4-2-3-1 shape that has served him well in the past but requires consistent creativity from the attacking midfielders and an all-round striker up front. Occasional listless spells, which are often then overcome, have led to some fans questioning his motivational abilities. A perceived lack of first-team players being played in the development team to gain match sharpness has even been raised. Ultimately, specific complaints tend to fall away when the team wins games and United are capable of an upturn in fortune. McNamara, too, has proved to be a talented manager in the past and ought to be allowed an opportunity to work through the problems he currently faces. Fans rail against the notion that he is popular with elements of the media but that often mistakes an appreciation of his back-to-back Scottish Cup and League Cup final appearances and some of the circumstances that he is working under. It is clear that the United starting line-up and squad are not as strong as last season. The dip in form can be traced back to the closure of the January transfer window, when United sold Gary Mackay-Steven and Stuart Armstrong to Celtic. The team won its next game, away to Stranraer in the Scottish Cup, but then failed to win again until 11 April. A run of four games against Celtic, that started with a draw and was followed by three defeats, was also demoralising. The transfer business was necessary - Mackay-Steven had already agreed a pre-contract with Celtic and so at least some money was recouped, while United need to sell every season to overcome annual losses - but the timing and the consequences irked supporters. So, too, did the subsequent revelation that McNamara receives a bonus from transfer fees received for players developed by the club. The contract is not unusual in other countries and will reflect a lower basic salary than his predecessors. The timing of the revelation provoked a response, even though it is the board that determines transfer activity. The more pressing issue for McNamara has been the recruitment policy, since potential has been sought over experience. There are young players at the club who have ability to develop but the team lacks assertive and time-served players in key areas. The board has worked hard to reduce debt - clearing the amount it owed to the bank and reducing other outstanding amounts - but there has also been investment in the team since 13 players have arrived in 2015, with fees being paid for four of them. United are a work in progress and although McNamara will expect Billy McKay to score regularly and Mark Durnan and Coll Donaldson to form a more solid partnership at the back, the team still lacks a sense of reassurance in moments of crisis on the field. Chairman Stephen Thompson remains in discussions with a consortium of other businessmen to take control of Newcastle Jets, the A-League club. He has spent time previously in Australia but continues to live in Scotland and has always insisted that he remains committed to United. His sister, Justine, now sits on the board and day-to-day control is currently in the hands of former Hearts managing director David Southern. United are two years into a five-year plan that was devised to address the club's finances, football and place in the community. The assertion is always that events are on track, although the suspension of head of youth, Stevie Campbell, is an issue that has still to be closed. With Thompson's recent lack of public profile in the media, doubt has been able to gather around the club. The focus will always be on the manager when results are disappointing and McNamara will expect the scrutiny but questions remain about what the immediate and long-term future holds for United.